Please refer to our stock # 5685 when inquiring. 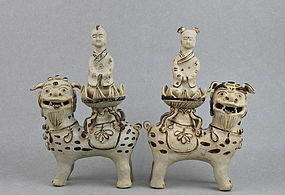 A very rare pair of boy and girl figures sitting on lotus bowl and lion Fu dogs, covered overall with black and white glaze. Southern Song dynasty, Jizhou ware. Condition is very good near perfect, only one of the tail of girl lion Fu dog is broken and re-glued, otherwise is excellent. High each: 23.5cm.